The aroma that comes from this chicken dish while cooking will drive your tastebuds crazy with hunger. We're big garlic fans in my family and it seems like we can never get enough of it. If you want to you can cut back on the amount of cloves you use in this dish. Next add the Italian seasoning, thyme, rosemary and chives. Whisk in the brown sugar. Place the chicken breasts in a ziplock bag or in a marinating dish. Pour the marinade over the chicken and refrigerate for at least an hour and a half. 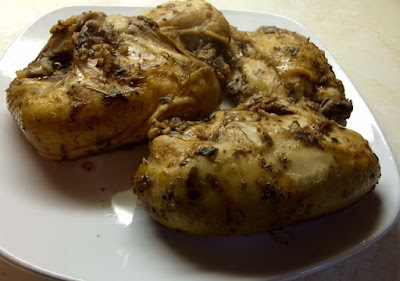 Pour the marinade over the chicken breasts and place in the oven for approximately 45 minutes depending on the size of the breasts, or until an internal temperature of 165°F. Remove from the oven and set the breasts on a platter covering with foil until you are ready to serve. Now this is my kind of chicken dish. Can't wait to try it. You can never have too much garlic, right? Besides, it is good for our health, as well as our taste buds. I know some people who would love this. Sharing it! Oh Susan you had me at the garlic, we also cook with a lot of garlic. Thanks looks delicious!! !